It seems like one of the new 'hip' places to go to for dinner is near my place and next to Alexandra Village. Located at Blk 119 Bukit Merah Lane 1, this coffee shop that used to be plagued with bad fengshui and rotating shop owners, has finally found a winning combination of stalls that serve typical cafe and restaurant food! The place has gotten sooo popular and crowded that it operates now more like a restaurant than a kopitiam. There's no such thing as free seating. You have to wait in line near the sign that's located at the middle pavement. Someone will somehow attend to you. How did this place become so popular? It started off with Stew Küche, serving up German and Austrian cuisine such as Pork Knuckle, Sausages and beer. I went there with my parents when they first opened in 2010 or so...the years are fuzzy. I honestly wasn't impressed with their pork knuckle but it was cheap. My dad was happier with their Oxtail Stew, which was what brought us back to the kopitiam for dinner. Unfortunately, waiting for any dish from Stew Küche meant waiting for 45 minutes. So...it was onto other foods! Remember how I mentioned that the place now operates like a restaurant? It's a bit more like a group of restaurants housed under one roof. Ordered their Cheesy Fish (S$10, if I remembered correctly), which essentially is Fish & Chips with nacho cheese drizzled on top. The fish is thick, the batter fried to perfection without it being oily. What I didn't like about it was the fake bacon on the salad. The whole place isn't Halal...so why use the fake stuff when real bacon tastes so much better and isn't really that expensive? Dad ordered the whole Grilled Mackerel (S$16, if I remembered correctly), served with potato salad, grilled pineapple, salad and honey mustard. Now...this main course is really worth the money for several reasons. Firstly, the potato salad was topped with bonito flakes, which is kind of cheeky but nice flavour nod to the mackerel. Then, the grilled pineapple rings helped to minimise the really fishy taste of the mackerel. Thirdly, the salad was really good. It tasted almost like a salsa and was a nice dimension away from the sweet of the pineapples. Lastly, the honey mustard is made with Dijon mustard. You can see the mustard seeds inside the sauce. They used real seasalt to grill the fish too. Took a photo of these only after eating...too busy eating...lol. 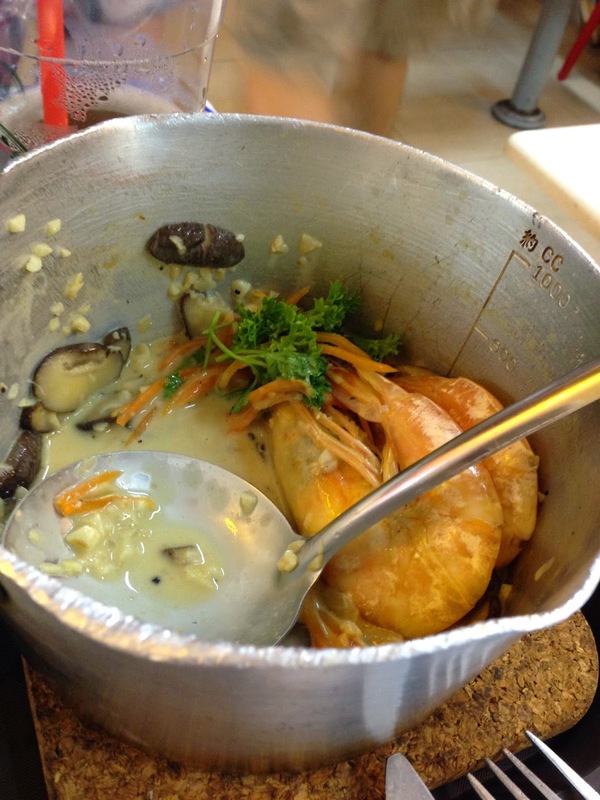 Anyway, Seasalt has various 'pots' of clams/prawns/mussels. We opted for the pot of prawns in garlic cream (S$16) and it comes with a small basket of bread. Other methods of cooking include the usual wine (au vin) and tom yum (again, if I remember correctly). 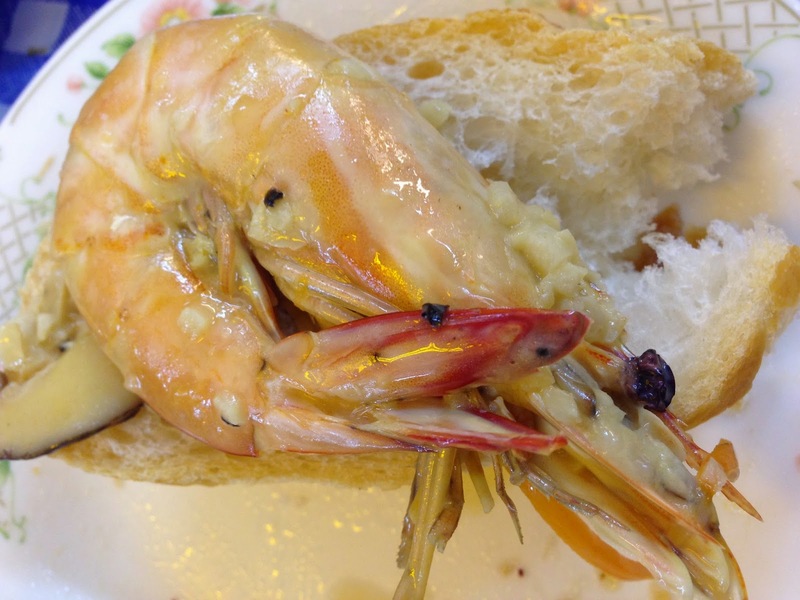 The prawns were fresh and the shell easily came off the flesh. The garlic cream was really really good. Although there was cream, it didn't feel heavy nor rich to the point where you didn't feel like eating much. Despite my low carb diet after 8pm, I munched on a piece of bread that soaked up all the creamy goodness. Definite MUST TRY. Next up is Immanuel French Food. I don't think there is anywhere else in Singapore where you can get such a thick, chockful of onions, delicious French Onion Soup for only S$4.90. It actually comes with 2 slices of toast with cheese. I ate up one. Teehee. Dad has tried their Duck Confit and he claims that it's better than the ones served at Saveur and La Petite Cuisine! I guess I do need to make another trip down to try out the main courses. Another popular stall is "Two Wings" and their speciality is fried chicken wings. We ordered their Spring Chicken (S$15.90) and it comes with salad and onion rings. I must say that the chicken is larger than a Spring Chicken. It was very well cooked - crispy thin skin and juicy, succulent meat. Better than KFC/ Texas/ Popeye's. 'Nuff said. There also is a drink stall named "Brown Sugar" which ironically serves up healthier fare such as fruit juices and teas. There also is a dessert stall named "Brick" which opened recently and their desserts are really quite easy on the pockets. Their cookies start from S$1, cakes from S$2.50 and the most expensive would be their lava cakes at S$7-8. Didn't try any because we were just too stuffed. All in all, it's a good place to have good food and not care about what you wear and how loud you talk. Smokers will also delight in their designated corner and puff away while sipping on Hoegaarden and other imported beers. My advice is to avoid going there on weekend evenings. Unless you really have to.